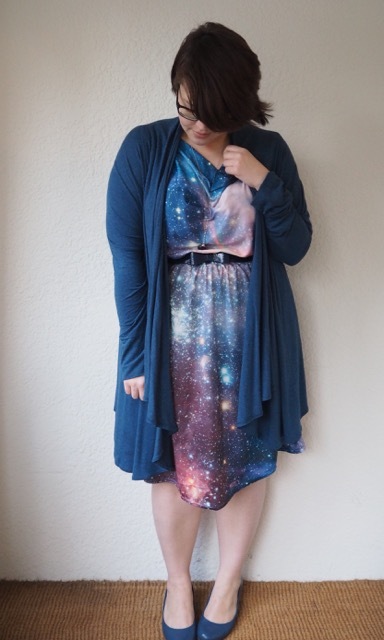 My first Spacedress is long gone, but with stars and star-prints looking like one of the major trends this season (hurrah!) I thought maybe it was time to whip up a new one. 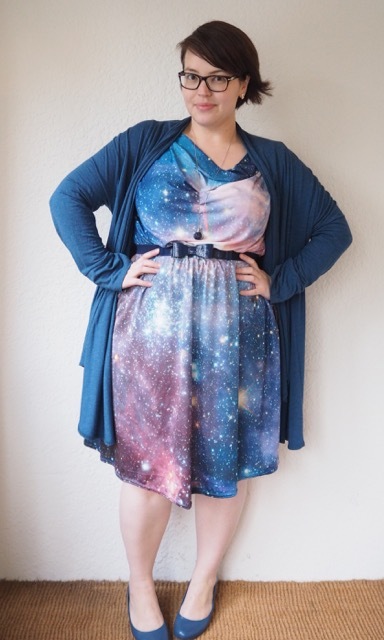 I chose the performance knit fabric, which at US$24 a yard certainly isn’t the cheapest dress fabric out there, but I’ve worked with it before and found it to have exceptional colour quality, wearability and drape. It’s a 100% polyester knit with a bit of a swimsuity sheen to it, and it has “moisture management” which would explain why even on hot days I don’t get sweaty in it. It has a bit of weight, and only about 25% stretch which means it holds its shape well and doesn’t bag out. 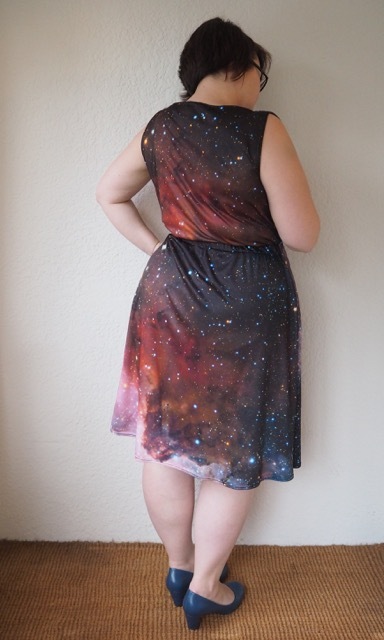 I was going to go for the same print as last time – the Star Forming Regions – but when I plugged in the number of yards I needed (I would definitely recommend this step if you’re buying from Spoonflower) I realised the fabric would end up with tiles as the pattern repeated. 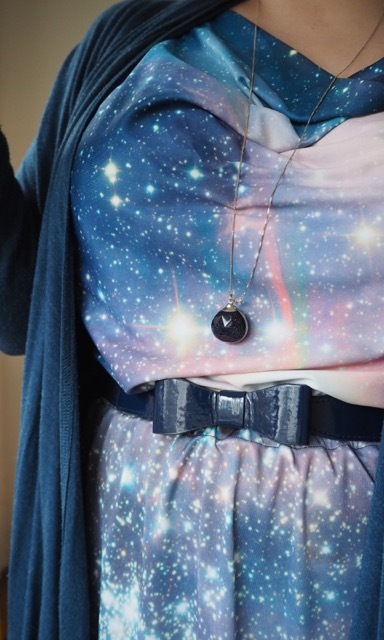 Instead I opted for this amazing image of the Carina Nebula which at 85×58″ in size would be big enough for me to make my favourite Myrtle sewing project without any visible repeats. There’s a fairly big differentiation in the colours of the Carina Nebula. From deep blues to pinks and golds and deepening to purple and red in the centre. I picked the pinks and blues for the front, and kept the deeper and darker colours for the back. 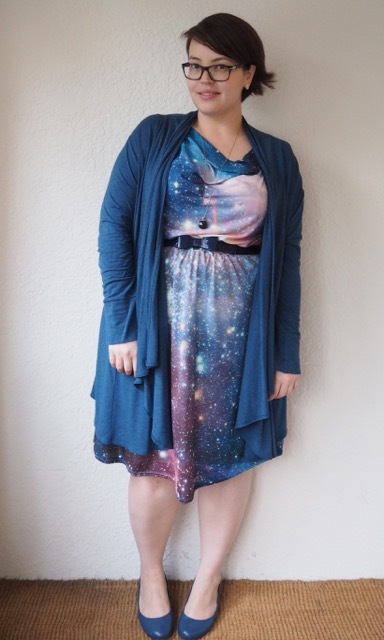 And then, because it was freaking cold, I covered the lot up with a long draped cardigan, and added my bow belt from Closet Confessions and my sparkly galaxy necklace which is impossible to photograph so you’ll just have to take my word for it that in person it’s the prettiest sparkliest thing you’ve ever seen. 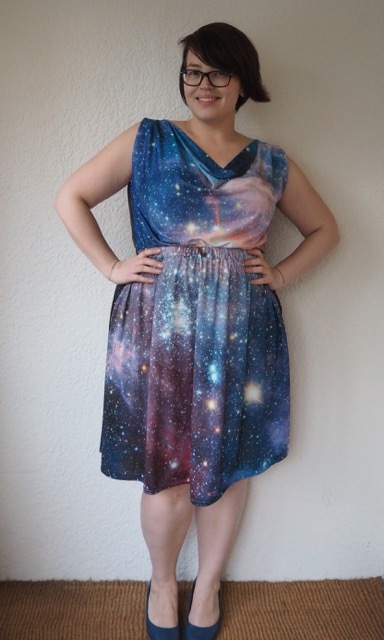 This is the fifth Myrtle dress that I’ve made, so I’m definitely getting my money’s worth with the dress pattern. 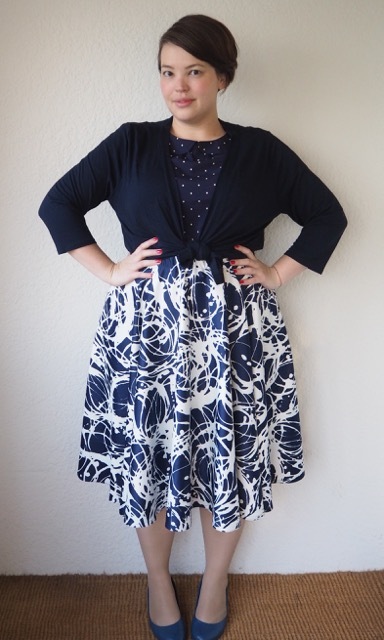 It’s such a great one for beginner sewers, because it doesn’t have any tricky zippers or sleeves, the waistband is elasticised, and the draped neckline and knit fabric is very forgiving for people who aren’t confident about tweaking patterns for full-bust adjustments, or sway-back adjustments. I’m a little bit under the weather at the moment, and missed my last tw-ways deadline – sorry everyone! I made it out today though, and met my lovely friend K for a quick trip to Markit at Fed Square and a nice warming bowl of ramen. We’re well and truly into the cooler months now, and I’m discovering just how little of last year’s winter wardrobe still fits me comfortably (oops!). 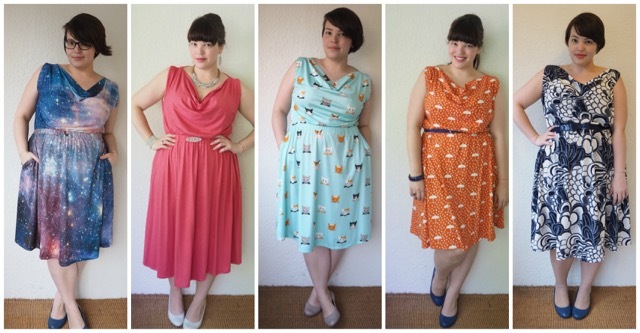 As a result I’ve been wearing a lot of old pieces that you probably haven’t seen in a looooong time! 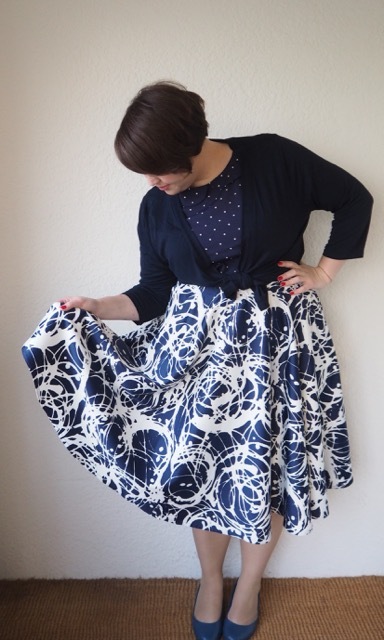 This fifties-style skirt used to be a dress, and the last time you saw it on the blog was at the start of 2013. I teamed it today with (another!) 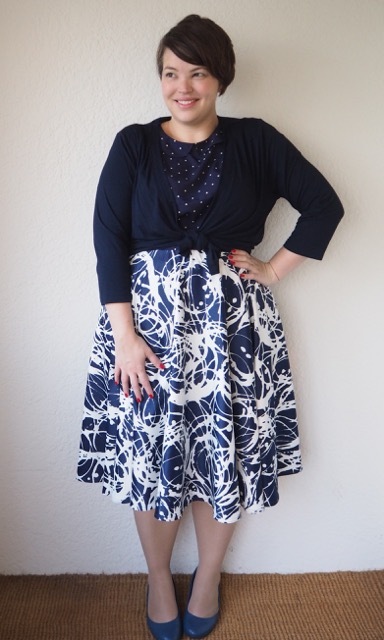 navy polkadot blouse from Princess Highway. 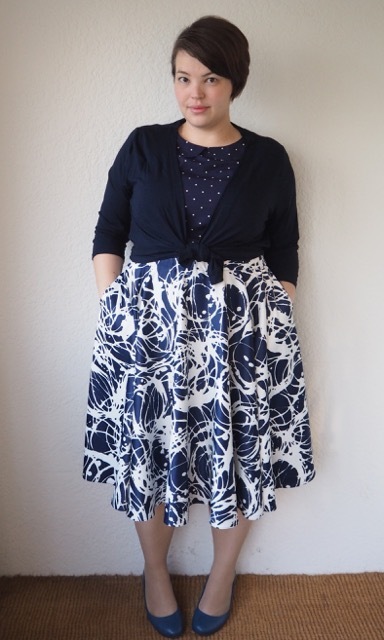 This one’s made of a slightly heavier fabric than my other navy polkadot blouse from Princess Highway, which has a separate collar from my, um, third navy polkadot blouse from Princess Highway (OK, so maybe I have an addiction). My multiple navy polkadot blouses has reminded me as well of the urgent need I have to do a major wardrobe cull. My lovely boyfriend and I have decided to do the co-habiting thing (Suki, who’s nearly as in love with him as I am, is delighted) which means that my overfull wardrobe situation needs to be addressed rather urgently. Stay tuned, I’ll be sure to link up my eBay link once the posting is live!